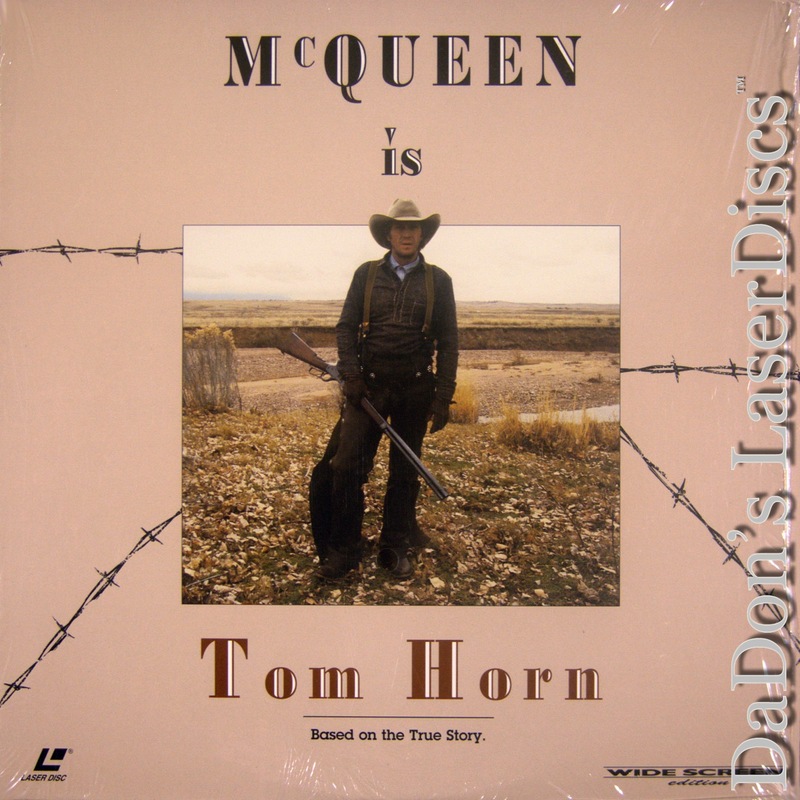 Tom Horn 1980 - 98 min. 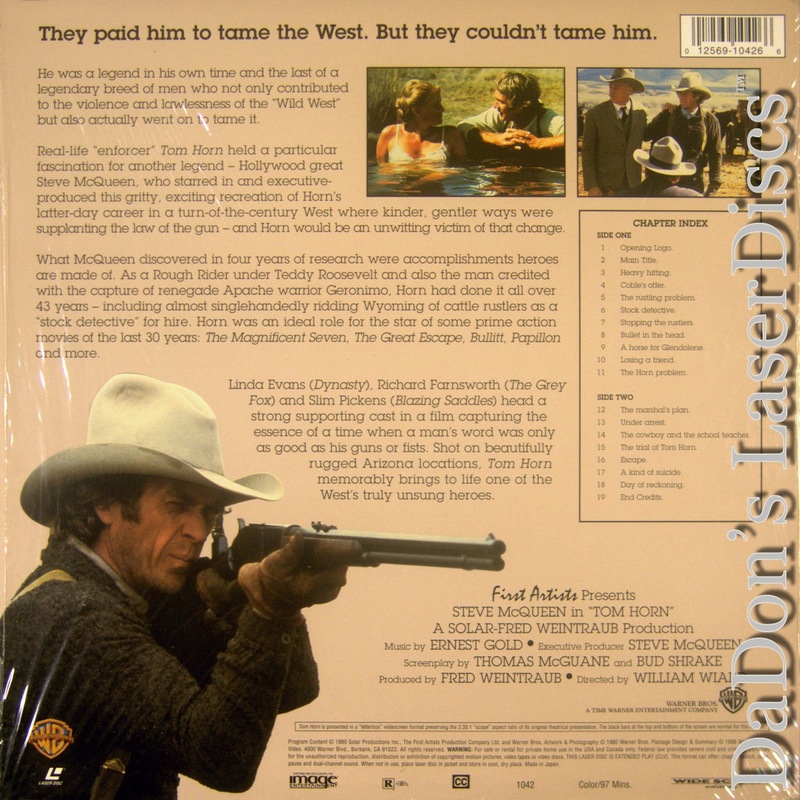 - Color Genre: Western LaserDisc Movie Review: Steve McQueen's penultimate film deals with a fascinating western legend, founded on an insightful script by Thomas McGuane and Bud Shrake. Unfortunately, the film was done in by the five directors ----Don Siegel, Elliot Silverstein, James Guercio, William Wiard, and McQueen himself---- that were, at one point or another, attached to the project. The film deals with the infamous Texas gunslinger Tom Horn. Horn gained fame for a variety of exploits; he served with Teddy Roosevelt's Rough Riders and was the Pinkerton detective who captured the notorious outlaw Peg Leg Watson. 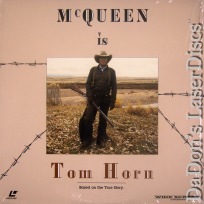 But as Tom Horn begins, something in Horn (Steve McQueen) has snapped. Tom quits the Pinkertons and hires himself out to rancher John Coble (Richard Farnsworth) to assist him in putting an end to his problems with the local homesteaders and rustlers. But Horn performers his job with a chilling intensity, killing so many people with such bloodthirsty rage that it is even too much for Coble and the ranchers to take. When Horn's violence cannot be stopped, Coble has to take the law into his own hands to put a halt to Horn's bloodbath. ---- Paul Brenner Thanks for Visiting DaDon's Rare LaserDiscs ! Reviews, Articles, Newsletter and Information for Movies on LaserDisc LD Laser Disc, LazerDisc.